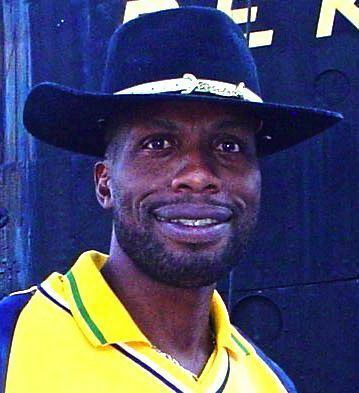 Sir Curtly Elconn Lynwall Ambrose (born 21 September 1963) is a former cricketer from Antigua who played 98 Test matches for the West Indies. A fast bowler, he took 405 Test wickets at an average of 20.99 and topped the ICC Player Rankings for much of his career to be rated the best bowler in the world. His great height—he is 6 feet 7 inches (2.01 m) tall—allowed him to make the ball bounce unusually high after he delivered it; allied to his pace and accuracy, it made him a difficult bowler for batsmen to face. A man of few words during his career, he was notoriously reluctant to speak to journalists. He was chosen as one of the Cricketers of the Year in 1992; after he retired he was entered into the International Cricket Council Hall of Fame and selected as one of West Indies all-time XI by a panel of experts. Born in Swetes, Antigua, Ambrose came to cricket at a relatively late age, having preferred basketball in his youth, but quickly made an impression as a fast bowler. Progressing through regional and national teams, he was first chosen for the West Indies in 1988. He was almost immediately successful and remained in the team until his retirement in 2000. On many occasions, his bowling was responsible for the West Indies winning matches which seemed lost, particularly in association with Courtney Walsh. Against Australia in 1993, he took seven wickets while conceding a single run; in 1994 he was largely responsible for bowling England out for 46 runs, taking six for 24 (six wickets for 24 runs). Ambroses bowling method relied on accuracy and conceding few runs; several of his best performances came when he took wickets in quick succession to devastate the opposition. He was particularly successful against leading batsmen. From 1995, Ambrose was increasingly affected by injury, and several times critics claimed that he was no longer effective. However, he continued to take wickets regularly up until his retirement, although he was sometimes less effective in the early matches of a series. In his final years, the West Indies team was in decline and often relied heavily on Ambrose and Walsh; both men often bowled with little support from the other bowlers. Following his retirement, Ambrose has pursued a career in music as the bass guitarist in a reggae band. He was knighted by the Antiguan government in 2014. Ambrose was born in Swetes, Antigua on 21 September 1963, the fourth of seven children. His father was a carpenter from the village. The family had no background in cricket, but his mother was a fan, and Ambrose played in his youth, primarily as a batsman. At school, he performed well academically, particularly in mathematics and French, and became an apprentice carpenter upon leaving at the age of 17. He briefly considered emigrating to America. At the time, his favourite sport was basketball, although he occasionally umpired cricket matches. Ambrose was not particularly tall until he reached his late teens, when he grew several inches to reach a height of 6 feet 7 inches (2.01 m). Around this time, his mother encouraged him to become more involved in cricket. Success as a fast bowler in a softball cricket match persuaded Ambrose to play in some club matches at the age of 20. He quickly attracted the attention of coaches and progressed to the St Johns cricket team. Selected in the Leeward Islands competition, he took seven for 67 (seven wickets for 67 runs) for Antigua against St Kitts. He made his first-class debut for the Leeward Islands in 1985–86 and took four wickets in the game, but failed to retain his place the following year. A Viv Richards scholarship provided funding for him to play club cricket in England for Chester Boughton Hall Cricket Club in the highly rated Liverpool Competition during 1986 where he took 84 wickets at an average of 9.80. The following year, he returned to England to play for Heywood Cricket Club in the Central Lancashire League, for whom he took 115 wickets in the season; these experiences helped to improve his bowling technique. Upon his return to Antigua, Ambrose practised intensely, regained his place in the Leeward Islands team and, in the absence of leading bowlers Winston Benjamin and Eldine Baptiste with the West Indies team, became the main attacking bowler in the side. He was no-balled for throwing in the first match, which Wisden Cricketers Almanack later attributed to confusion caused by his attribute of flicking his wrist prior to releasing the ball to impart extra pace, and there were no subsequent doubts about the legality of his bowling action. Retaining his place when the international bowlers returned, he took 35 wickets—including 12 in a match against Guyana, of which nine were bowled—in five matches in the competition. Wisdens report on the West Indian season said his performance was "dominant", although few had heard of him previously. Identifying his yorker as his most effective delivery, it noted that he "never lost his pace, his accuracy, or his thirst for wickets". Ambrose made his debut in the English County Championship for Northamptonshire County Cricket Club in 1989—the club signed him for the 1988 season but as he was playing in the West Indies touring team, he was unavailable that year. He took a wicket with his first delivery for the club, but was not particularly successful in the first part of the season; he settled down later and took 28 first-class wickets at 28.39 for Northamptonshire in nine games. Early in 1990, England toured the West Indies and played four Tests—a fifth was abandoned owing to rain. The visiting team dominated the first part of the series but West Indies eventually won 2–1. Ambrose was unfit for the first Test, which West Indies lost, and the first four ODIs, but returned to take four for 18 in an ODI organised to replace the rained-off second Test. After a drawn third Test, West Indies won the fourth game. The home captain, Viv Richards, set England 356 to win, but after losing early wickets, the English batsmen entered the last hour of the game with five wickets still to fall. Ambrose took the new ball and removed the last five batsmen for 18 runs in 46 deliveries, four of them leg before wicket. He finished with figures of eight for 45, ten wickets in the match, and West Indies levelled the series with a 164-run win. Ambrose was man of the match. He took six wickets in the final match, to finish the series with 20 wickets at 15.35, finishing top of the West Indies averages. Ambrose, along with the other home bowlers, was described by Alan Lee in Wisden as an "awesome handful in the latter part of the series", and described his match-winning spell in the fourth Test as "unforgettable". Ambroses other appearances for West Indies in 1989–90 were all in ODIs, although he did take more than two wickets in any innings except in the match against England. He also took 22 first-class wickets for the Leeward Islands, and when he returned to England to play for Northamptonshire in 1990, took 58 first-class wickets to top the clubs bowling averages. In one-day cricket for the county, he took 13 wickets while conceding an average of just 2.53 runs per over. Ambrose and Walsh missed the Mini World Cup ODI tournament in October 1998, in Ambroses case following damage to his house caused by Hurricane Georges. They returned to the team for West Indies first ever tour of South Africa, and Ambrose took 13 wickets in the series at an average of 23.76, but West Indies lost every game of the five-match series. In the first Test match, Ambrose and Walsh bowled effectively but lacked support from the other members of the attack. In the second Test, the pair again lacked support, but bowled well. The visiting team generally bowled too many bouncers to be effective, but Ambrose took eight wickets in the game, including six for 51 in the second innings. He was ineffective in the third Test, and despite bowling what Geoffrey Dean in Wisden called a "superb opening spell", could not prevent South Africa building up a large total against an attack lacking two other main bowlers. Ambrose pulled out of the attack himself later in the innings with a back injury, and did not bowl in the second innings. He missed the final Test with a hamstring injury. He was fit to play in the first six games of a seven-match ODI series, won 6–1 by South Africa, and took six wickets. In March 1999, West Indies then faced Australia in a home series, and contrary to expectations, West Indies drew the series 2–2. The outcome of the series was decided by a small group of players, including Ambrose, whom Mike Coward described in Wisden as "five of the most distinguished cricketers of all time". Ambrose took 19 wickets at 22.26, second to Walsh in the averages. His best figures came in the fourth and final Test, when he took five for 94 in the first innings and eight wickets in the match, but in the third match, although he only took four wickets in total, Coward described Ambrose as "rampant" and wrote that Steve Waugh, who scored 199, had to survive "some extraordinary pace bowling from Ambrose". He played four of the ODIs which followed in April, taking three wickets. The following month, Ambrose took part in the 1999 World Cup in England, and he was the second most economical bowler in the tournament in conceding an average 2.35 runs per over while taking seven wickets at 13.42. West Indies went out in the group stages, and Matthew Engel suggested that the bowlers were tired and judged the team "outright failures". Following the World Cup, the West Indian selectors chose to rest Ambrose, along with Walsh, from alternate ODI tournaments. Ambrose consequently missed two ODI series, but in October 1999 he played two ODIs in a series against Bangladesh in Dhaka and three in a tournament in Sharjah. In the latter competition, Ambrose conceded five runs from ten overs against Sri Lanka, the second most economical bowling figures from a full allocation of 10 overs in all ODIs. However, in all five matches, he took just one wicket, and he injured his elbow in Sharjah which forced him to miss West Indies tour of New Zealand which began in December. Ambrose recovered in time to play for the Leeward Island in domestic cricket, taking 31 wickets at 12.03 in seven first-class games. When Zimbabwe toured the West Indies, he returned to the West Indies team to be named man of the match in the first Test—Zimbabwe were bowled out for 63 when chasing 99 runs to win. He took a wicket in the second and final Test, and four wickets in six matches during a three-way ODI series also involving Zimbabwe and Pakistan. These were his final ODIs; in 176 matches, he took 225 wickets at an average of 24.12 and conceding 3.48 runs per over. Pakistan subsequently played a three-Test series against West Indies; in his last home series, Ambrose took 11 wickets at 19.90 to head the West Indian bowling averages.